I must admit I was drawn to this children’ book by the cover, and the subtitle. It looks and feels like an old illuminated book with mythic tales. And reads like The Canterbury Tales, where each character adds a piece to the story. Everything about this children’s book is unusual, thought-provoking, and humorous. 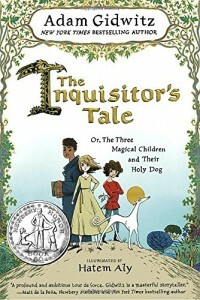 While it is both a terrific work of historical fiction, and somewhat of a moral tale, this children’s book will have a very specific audience. That’s because Gidwitz addresses head-on some very, very difficult issues that are historically true about the middle ages – burning of witches, the inquisition, the discrimination against Jews, and more. How could this be enjoyable to read? I have to admit that it was! I don’t know how he pulled it off, but perhaps because along with the historical description, Gidwitz adds contemporary outrage, and humor as well, allowing us some perspective on the bizarre behavior of the human race! Perhaps I underestimate young readers, but personally, I’d rather have older children, 12 and up, read this. History is history, but we need a certain level of maturity to read it. At the same time, this children’s book brings a particularly important message for the times we live in – tolerance, especially religious tolerance. I do recommend this children’s book, and leave it to adults to decide at what age their child should read it.